I've plugged The Great Orioles Autograph Project before, but check out its featured Baltimore bobble head for this week. None other than HOF #5, Brooks Robinson! Brooks holds a special place in my heart as the first HOF to answer a letter of mine way back at age 13. 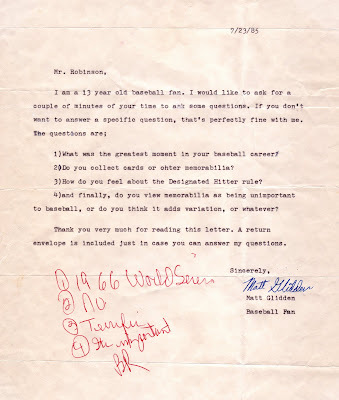 Find a scan of my questions and his response in the profile for 1973 Johnny Pro Orioles (fielding) #5. Orioles (and autograph) fans should keep tabs on The Great Orioles Autograph Project for more bobbles and other good stuff.